I decided stew was in order. I haven't made it in month, maybe in over a year. It's the kind of thing that makes a lot and "weathers" well, meaning it will be as good or even better, as leftovers in the upcoming days. 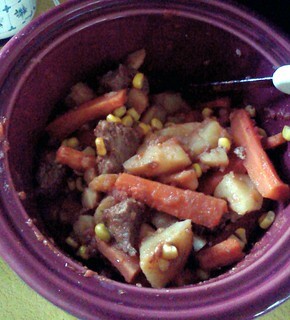 Thursday night, I cut up carrots and potatoes and diced a steak. I don't really like the meat stores can pass off as "stew meat". It can be kind of fatty and rather than imparting tenderizing to the meat, the fat makes it chewy. I prefer to purchase a flank or round steak and cut it into stew meat sized pieces. Once that was done, I dumped it into a plastic bag where the herbs and spices had been dumped. Shake the whole thing and stick the veggies and meat into the fridge. In the morning, dump the veggies and the meat into the crock pot with two cans of tomato sauce. Turn the pot to low and have a nice day at work. When I got home, the kitchen smelled wonderful. I added around 3/4 cup of frozen corn and let the whole thing cook one more hour. At 5:30, this was supper. 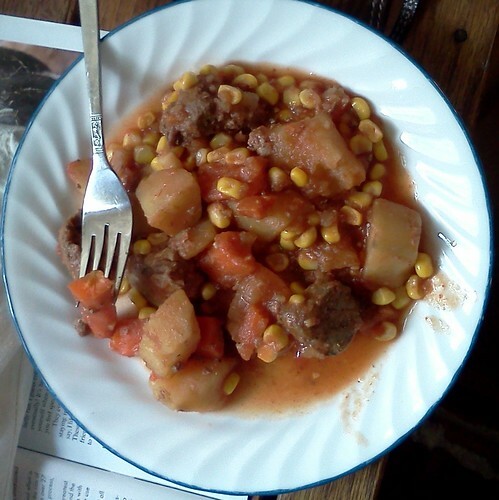 Scoop it out onto a plate and the aroma of hearty beef stew filled the air. Oh man. This was wonderful. I have 3 more meals from this. I really need to find a spot to keep the crock pot upstairs. I'd, no doubt, eat better and healthier if it was handy.